This is a TIE-U post associated with Jonathan Kolstad’s The Economics of Health Care and Policy (Penn’s HCMG 903-001, Spring 2012). For other posts in this series, see the course intro. Links to all but one paper in this post are to ungated PDFs. Repeal of health reform, either by court decision or legislatively, is a hot topic. Most observers, myself included, do not think the Supreme Court will strike the law or even declare the individual mandate unconstitutional. Far more likely is some form of legislative repeal, but only if the GOP takes over the government in this election cycle. Even then, some elements will be more difficult to repeal than others, particularly if filibuster rules do not change. In that case, without 60 votes in the Senate, the regulatory reforms (non-budget items) cannot be overturned. Last week Kevin Drum listed two important regulatory provisions of the law, repeal of which would require 60 Senate votes under current filibuster rules. The two most important are guaranteed issue and community rating. The first means that insurance companies are required to sell insurance to anyone who wants it, and the second means that they have to charge everyone the same price. (With a few specific exceptions, like designated higher rates based on age.) So what happens if they repeal most of Obamacare but not those two parts? What happens if insurance subsidies and the mandate are removed but not these two provisions is that adverse selection due to the purchase of insurance by less healthy and more costly individuals may threaten the viability of the individual market. Note that group markets, particularly most large-group ones, are less likely to be disrupted because they are subsidized by the favorable tax treatment of employer-sponsored health insurance and they serve workers, many of whom (though not all) are better able to afford coverage than those seeking it in the individual market. Therefore, if adverse selection becomes problematic, I do not expect many insurers to participate in the individual market. There may not be an individual market. A recent paper by Hackman, Kolstad, Kowalski  sheds some light on the chances and size of the potential adverse selection problem. Studying counties in Massachusetts before and after health reform in that state (which bears many similarities to the national law), they examine the relationship between coverage and cost per insured individual. Massachusetts had guaranteed issue and community rating in place before its reform law offered subsidies and carried a mandate. If the cost of the marginal enrollee is below the average cost of those who are already insured, selection is adverse; if the cost of the marginal enrollee is above the average cost of those who are already insured, selection is advantageous. Therefore, as demonstrated by Einav, Finkelstein and Cullen , the sign of the slope of the average cost curve captures selection. Intuitively, neutral selection — the case for which enrollees have the same cost risk as non-enrollees — would correspond to a change in coverage vs change in cost line that is horizontal. A deviation in slope from horizontal is informative about the relative cost of prior enrollees to new (or marginal) enrollees. If a new enrollee is cheaper than prior ones then the enrolled group is more costly than the nonenrolled group and the slope is negative. That’s adverse selection. That’s what the authors found. 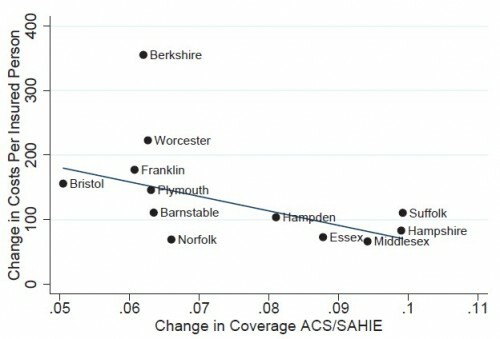 Our results suggest that increased coverage due to reform in Massachusetts lowered average hospital costs for the insured, and thus average premiums before loading, by about $124. Our results suggest that a partial implementation of PPACA would reduce pooling, leading premiums to fall by less than they otherwise would or even increase. Just because selection is adverse, however, does not mean that the market necessarily collapses. It’s possible to have stable adverse selection, whereby premiums settle at a higher level than they otherwise would be but do not spiral ever higher. Or, it’s possible to experience a “death spiral” in which premiums grow so high that products cannot be maintained. This is not a mere theoretical concern. Discontinuation of products due to adverse selection has been documented. Cutler and Reber  examine one such PPO product at Harvard in the mid-1990s and they point to others. Harvard is not alone in finding difficulty maintaining more generous plans. Stanford University and the State of Minnesota, for example, also moved to equal contribution rules and were forced, a few years later to discontinue their most generous plans. There is a suggestion in each case that adverse selection was to blame [Royalty and Solomon 1995; Feldman and Dowd 1993]. Similarly, the Massachusetts Institute of Technology also moved to an equal contribution rule in the 1980s and was forced in 1997 to discontinue its indemnity policy. Our conversations with officials running the MIT plan suggested that the growing presence of adverse selection was an important factor in this decision. Note that Hackman et al. were examining selection into an entire market (the Massachusetts individual one) while Cutler and Reber and others they cite are examining selection across plans within a market. In either case, a concern about selection is that it imposes a welfare or deadweight loss (in “econ speak“). Intuitively, each of us wants to choose an available health plan that maximizes our consumer surplus (the value we receive less the cost of the plan). Adverse selection experienced by a plan increases the cost of that plan but not the benefits you’d receive from it. Thus, if you remain in the plan, your consumer surplus is reduced. If you switch out of the plan because of the distortion due to adverse selection, then your consumer surplus is also lower than it would have otherwise been in the absence of adverse selection. Either way, it’s a welfare loss. Because adverse selection increases costs and reduces sales, there’s also a potential loss of economic profits (producer surplus) by the plan, another source of welfare loss. So, it’s clear that repeal of the ACA’s insurance subsidies and the mandate but not the insurance regulatory reforms would likely lead to adverse selection, potentially destabilizing or eliminating markets, and the associated welfare loss. On the other hand, some would no doubt argue that the freedom to decline insurance has an associated welfare gain. I’ve never seen it quantified. Though I’ve tried to keep this at an intuitive level and draw policy implications, as I will in all such TIE-U posts, many papers explore the mathematics more deeply, either algebraically, graphically or both. See Newhouse , Rothschild and Stiglitz , or Cutler and Zeckhauser (ungated working paper here) , for example. Hackman, Martin, Jonathan Kolstad and Amanda Kowalski. (2012). “Health Reform, Health Insurance, and Selection: Estimating Selection into Health Insurance Using the Massachusetts Health Reform” American Economic Review (Papers and Proceedings). Einav, L., A. Finkelstein and M. Cohen, “Estimating Welfare in Insurance Markets Using Variation in Prices” Quarterly Journal of Economics, forthcoming. Available as NBER Working Paper # 14414. Cutler, D. and S. Reber. (1998) “Paying for Health Insurance: The Tradeoff Between Competition and Adverse Selection,” Quarterly Journal of Economics, 113(2): 433-466. Newhouse, J. P. (1996) “Reimbursing Health Plans and Providers: Efficiency in Production Versus Selection.” Journal of Economic Literature, 34(3): 1236-63. pp.1236-1241. Rothschild, Michael and Joseph E. Stiglitz (1976) “Equilibrium in Competitive Insurance Markets: An Essay on the Economics of Imperfect Information,” Quarterly Journal of Economics (4):630-649. Cutler, D. and R. Zeckhauser, “The Anatomy of Health Insurance,” Chapter 11 in Handbook of Health Economics, Eds. A.J. Culyer and J.P. Newhouse, North-Holland, 2000. If the mandate is struck down, it’s not clear how much else falls. That’s the “severability” question, being separately argued at the Court. The insurance industry has argued strongly that if the mandate dies, community rating and guaranteed issue have to go as well, because of adverse selection. Maybe I’ll post on this tomorrow.